Piazza Ferretto (the main square), Torre dell'orologio (the clock tower) and Via Palazzo (an old street) are the most important historic remnants of Mestre's past. Together they still represent the main nucleus of the variant of the General Urban Development Plan for the historic town centre adopted in 1991 and approved in 1997. The first, the most important village outside the walled Mediaeval town, is the most frequently visited site on the Venetian mainland and represents the piece of the puzzle keeping the highly complex and contradictory urban identity together. The second, which incorporates the last gate to have survived the gradual destruction of the defensive walls, is the symbol of the town. Lastly, Via Palazzo, once protected by the town walls, is the best-preserved example of Mestre's past scale and image. As a result of relentless transformations, the sense of the original relationship between the Square, Tower and Street has been lost in time. If you observe the Tower from the Square, you get the impression you are standing inside the town rather than outside it. Vice versa from Via Palazzo. The perception of the town's original nucleus has therefore been turned around. The projects in question have aimed to correct this state of affairs with a series of devices. First of all, by creating a sharp distinction between the materials, colours and lighting of Piazza Ferretto and Via Palazzo (associating the cold ones with the sense of "outside" and the warmer ones with the sense of "inside"). Secondly, by coming up with a plan for the Square which, though allowing for the presence of the Tower, makes much less reference to it than the plan for Via Palazzo. In addition, by restoring the town's Tower to its former guise - a gate - by pulling down a building built in the early '60s which blocks access to the gateway from Via Palazzo. Lastly, by accentuating the Tower-Street link with an outside staircase designed with a dual purpose: to evoke the ancient, close relationship between the walls and the town within as well as to create a "divide" between this duo and the Square. When considered in terms of a plan, Piazza Ferretto can be broken down into the combination of two triangles. The side made up of the front running from the church to the Tower is common to both, as is the vertex in the virtual point in which, if this front was extended, it would meet the extensions of the opposite fronts which are broken at the point where Palazzo Da Re stands. From this point, it has been possible to establish a surprisingly simple angular division whose regulating lines act as a support both for the more important elements of the traditional configuration and for the new ones. The aim is to dialectically reconnect the history with a controlled and yet free modernity. This is a fundamental paradigm of the appearance of the town and the basic concept of the whole project which makes use of precise yet open or non-finished formal definitions, consisting in references, interruptions, and revelations disclosing absent elements or missing links. In the centre of the Square, protected by the surrounding fountain, stands a sculpture by Alberto Viani, a symbol of unattainable perfection. The use of the space dictated by the project is the same as that originally adopted, though distributed and ordered in a different manner, with constant attention to the needs of the handicapped, the blind included. In the urban landscape as it appears today, the Tower (built around 1200) has the air of a rather well-preserved though somewhat mysterious ruin. The project, submitted as a working design and currently completing its bureaucratic route to approval, aims to pursue two specific objectives within the more general sphere of the preservation problem. The first goal, of historical and architectural importance, is to restore to view (only on the inside, for the moment) the most important indication of the tower's Mediaeval origin which has, until now, remained a secret: the town gate, whose gateway was originally free of steps and covered by a high cross vault. The second objective, important from an urban development point of view and a direct consequence of the first, involves freeing the gateway of the elements which have unrightfully invaded this space over the years, preventing it from being interpreted correctly. This implies no longer accessing the upper levels of the Tower from its ground floor but instead from an entrance above, as happened in olden times for defense reasons. The entrance can be reached via an outside staircase which, in accordance with the Piazza Ferretto and Via Palazzo projects, is meant to underline the differences between what were historically spaces outside and inside the town's defensive walls respectively. Once inside, the interior of the Tower can be visited by going up steps with an erratic layout so as to preserve and better appreciate the more significant elements of the building. The street is one of Mestre's oldest and, in terms of its buildings, best preserved. It once ran inside the walls which are now virtually non-existent. 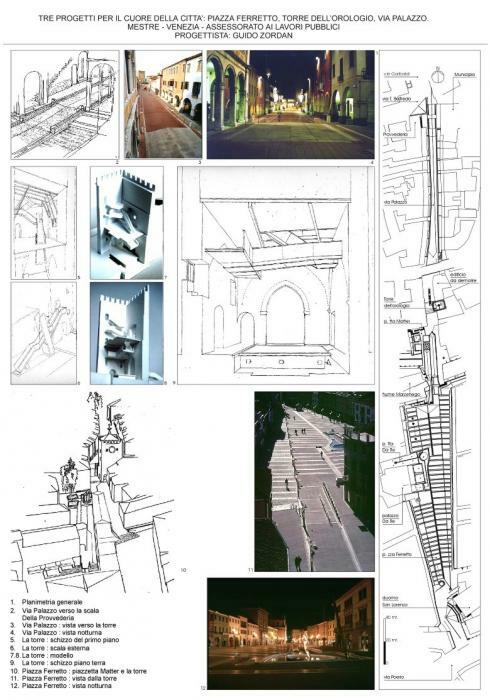 to support and reinforce the Tower restoration project so that it once again becomes an integral part of Via Palazzo, using "fired brick" paving to recall the exposed brick walls of the Tower, with the layout and slopes making explicit reference to the "Porta della Loggia" (Loggia gate). to provide the road with warmer lighting, different to that in Piazza Ferretto, so as to give the idea of the inside of a home.